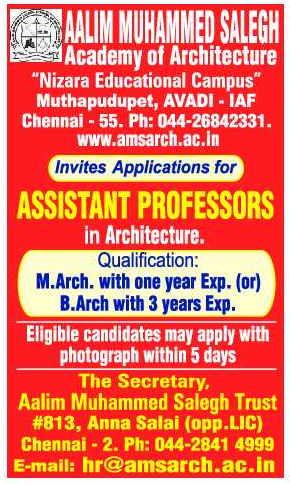 Aalim Muhammed Salegh Academy of Architecture, Chennai in THE HINDU newspaper has advertised for the recruitment of Teaching Faculty- Assistant Professor jobs vacancies. Interested and eligible job aspirants are requested to apply within 05 days from 02nd December 2018. Check out further more details below. About College: Alhaj Dr. S.M.Shaik Nurddin founded Aalim Muhammed Salegh Trust and named after his father in the year 1990 with the aim of imparting Technical and Medical Education in general and to educate the weaker sections and backward communities of the society in particular. This trust has been established to promote education amongst all sectors of people of the Nation with a view to wipe out ignorance, superstition and illiteracy and enabling the younger generation to equip themselves with compatible education for employment and overall development of the society. How to Apply: Interested and eligible candidates are requested to send application along with their CV, copies of certificates and PP size photos to the following postal address or email address.